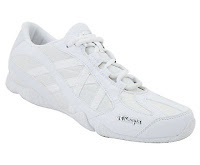 Just as cheerleading is a very competitive sport, the cheer footwear industry is also very competitive. Especially when it comes to performance level cheerleading! 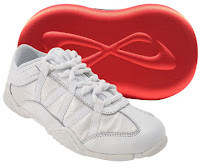 The two main footwear styles for performance level cheer are the Nfinity Evolution and the Kaepa Stellarlyte. While both styles have many different features they are both designed for the same type of cheerleading. Each style may or may not suit the needs of your squad and should be compared before deciding which style will work best. The Nfinity Evolution was one of the first extremely lightweight and flexible shoe styles in the industry. The Evolution weighs in at 6.5 oz. and is form fitting to the foot. Other features of the shoe include bubble laces to make sure the laces stay tied and Ankle Loc Technology to enhance the fit around the heel. They even come with a red carrying case, which is almost as popular as the shoe! The Kaepa Stellarlyte is also a top-selling performance shoe weighing in at 6 oz. Other features of the Kaepa Stellarlyte beside the lightness are the secure fit system for a better fit and the waterproof Scotchguard coating to keep the mesh cleaner. Both the Stellarlyte and the Evolution are adequate for performance level cheer and squads should take into consideration the features of each shoe to determine which style will best fit your squad needs. Take a look below and compare the two shoes. Cheer and Pom continues to offer top-of-the-line footwear and our Team Sales Specialists offer knowledge about all of our cheer shoes to help you select the best shoe for you and your team.